Q. It seems you found the calm and the movement you were wishing for at the start of the tournament. Do you feel that you've reached another step that you needed to have before the semifinal? RAFAEL NADAL: Obviously I really am playing better here. I'm happy the way that I played today especially. Was my best match on the tournament without any doubt.I said I need to make a change. I was confident that I can do it and I did.So now I am in semifinals, three matches in a row without losing a set. Last two matches I only lost one serve.That's start to be very positive numbers. Only numbers, but most important thing at the end is the feeling, and the feeling is completely different.If I was not happy five days ago about my level, today I say I am happy that I am in semifinals. Q. You have played many big matches in your career. You've got another big one coming up. Do you ever get accustomed to this challenge? What will it be like for you for the next two days? Will you be nervous? What will you do to remain calm? How will you need to feel when you go out there? RAFAEL NADAL: It was not the finals; it's the semifinals. That's the difference at the end. You are not playing a match for a title. You are just playing a match to be in the final.So is a big difference. No, is strange, but I am more calm today that I am competing for much more important things than one week ago. Then I was competing just for the second round.Sometimes it's a little bit strange, but that's how my mentality sometimes works.I gonna be nervous for the semifinals probably, yes. If not, better go home and do another thing. Because if you are not nervous to play the semifinals against the best player of the world, it's because you are not enjoying or you don't feel the passion for this game.Sure I will be a little bit nervous, but sure I will be more motivated than nervous. Q. Is it special for you because it's Novak? You mentioned it's a semifinal not even a final yet, but it's also Novak Djokovic. How does tat affect your thinking? RAFAEL NADAL: I know that I play against the best player of the world. I know that he's having great results for the last, well, the last ‑‑ no, for a long time. (Smiling. )No, I'm just trying to play my way, trying to find my rhythm and trying to play my best match. That's the only way to have a chance in that semifinals. I gonna try. Q. Congratulations. You mentioned before it's different to play semifinals instead of the final. Can you just explain that a little? RAFAEL NADAL: If you win, you didn't win nothing yet. That's a big difference. (Smiling). Q. I mean, playing, it's still Novak you're playing and you still have to win. RAFAEL NADAL: For me, seriously, I will answer the same way I answered hundreds of times: Doesn't matter if it's Novak or Federer or Ferrer or Tsonga. I try to come here and win a title. The opponent, when you are playing an important tournament, doesn't make any difference.You know, the people forget the opponents most of the times and stays the winner. That's all, no?Even if it's Novak ‑‑ I will prefer an easier opponent, but is Novak and I have to accept that's gonna be a very tough match and I'm going to try to play my best. That's the only thing.But I repeat: For me, it's the semifinals, and doesn't matter if it's against Novak or against another player, because the player who not gonna win the semifinals is not the champion of Roland Garros. He's just the semifinalist. That's the big difference. Q. Were you impressed by the performance of Tsonga yesterday? RAFAEL NADAL: Not much, no. Tsonga was playing well during all the tournament. He didn't lose a set. Being in quarterfinals that's not easy. So yesterday I think Roger lost an opportunity the first set. If you win the first set a person play like Roger, the match changes because Roger is a player who put pressure on you. And when you lose the first set the way that he lost and then you have the break in the first game of the second against a player who know ‑‑ who you know that he gonna serve well, he's playing with extra motivation for the crowd, for everything, so you are in a difficult position.Tsonga managed very well all the match. He played solid. He played aggressive. He played the way that he had to play to win the match. And he did. That's all. Q. You have had so much success since you came back that we've almost got to the point where no one mentions your knee anymore. Do you still think about it a lot, or are you almost getting to the point where you don't think about it? 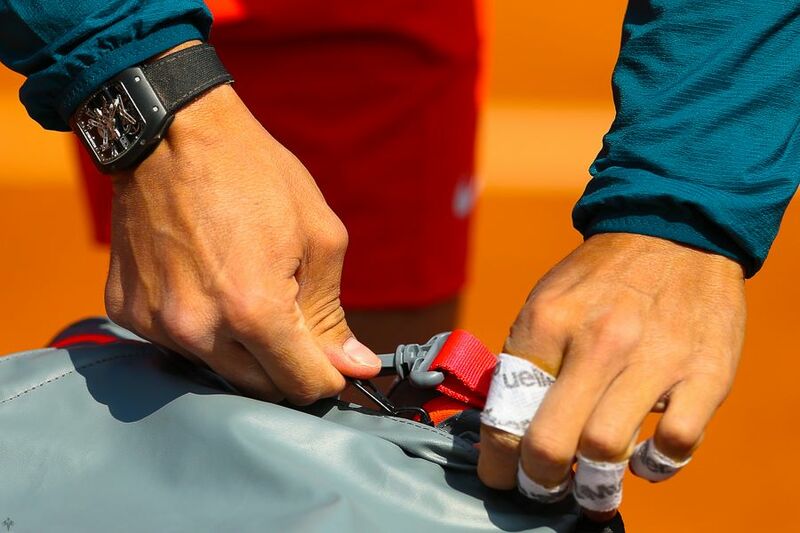 RAFAEL NADAL: You were in Rome? I said I not gonna talk anymore about the knee. So before semifinals of Roland Garros, I don't want to talk about my knee. I am happy to be here and I am enjoying the competition another time.For me to be here is great news, as I said before. And even if I feel my knee today I will never say after winning six tournaments and be in semifinals of Roland Garros.